This AZ Petrified Wood polished log stands 11 inches tall and measures 5 3/4 x 5 3/4 inches across. Please email for shipping charges. This AZ Petrified Wood polished log stands 8 inches tall. The face measures 7 1/2 x 6 inches. It weighs over 22.5 Lbs. Please email for shipping cost. This AZ Petrified Wood polished log stands 10 inches tall. The face measures 11 x 10 inches. It weighs over 43 Lbs. Please email for shipping cost. This AZ Petrified Wood polished log stands 11 inches tall. The face measures 8 1/2 x 9 1/2 inches. Please email for shipping cost. This AZ Petrified Wood polished log stands 10 1/2 inches tall. The face measures 9 x 7 1/2 inches. Please email for shipping cost. This AZ Petrified Wood polished log stands 12 1/2 inches tall. The face measures 10 3/4 x 9 1/2 inches. Please email for shipping cost. This AZ Petrified Wood polished log stands 11 1/2 inches tall. The face measures 6 1/4 x 5 1/2 inches. Please email for shipping cost. This AZ Petrified Wood polished log stands 7 inches tall. The face measures 7 1/2 x 6 1/2 inches. Please email for shipping cost. This AZ Petrified Wood polished log stands 14 1/2 inches tall. The face measures 7 x 6 1/2 inches. Please email for shipping cost. This AZ Petrified Wood polished log stands 13 inches tall. The face measures 6 1/2 x 5 1/2 inches. Please email for shipping cost. This AZ Petrified Wood polished log stands 15 inches tall. The face measures 8 x 7 1/2 inches. Please email for shipping cost. This AZ Petrified Wood polished log stands 9 inches tall. The face measures 7 1/2 x 6 1/2 inches. Please email for shipping cost. This AZ Petrified Wood polished log stands 7 inches tall. The face measures 11 1/4 x 8 inches. Please email for shipping cost. This AZ Petrified Wood polished log stands 8 1/2 inches tall. The face measures 10 1/2 x 9 1/2 inches. Please email for shipping cost. This AZ Petrified Wood polished log stands 11 1/2 inches tall. The face measures 12 1/2 x 10 inches. Please email for shipping cost. This AZ Petrified Wood polished log stands 12 inches tall. The face measures 9 1/2 x 14 inches. Please email for shipping cost. This AZ Petrified Wood polished log stands 4 1/2 inches tall. The face measures 15 x 12 inches. Please email for shipping cost. This AZ Petrified Wood polished log stands 12 inches tall. The face measures 14 1/2 x 10 inches. Please email for shipping cost. This AZ Petrified Wood polished log stands 9 inches tall. The face measures 5 1/2 x 6 1/2 inches. Please email for shipping cost. This AZ Petrified Wood polished log stands 9 inches tall. The face measures 13 x 13 inches. Please email for shipping cost. This AZ Petrified Wood polished log stands 7 inches tall. The face measures 12 x 10 inches. Please email for shipping cost. This AZ Petrified Wood polished log stands 10 inches tall. The face measures 11 x 13 1/2 inches. Please email for shipping cost. This AZ Petrified Wood polished log stands 10 1/2 inches tall. The face measures 16 x 12 inches. Please email for shipping cost. 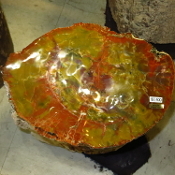 This AZ Petrified Wood polished log measures 11 1/4 inches long. The face measures 4 1/2 x 4 1/2 inches. This piece does not stand on its own. Please email for shipping cost. This AZ Petrified Wood polished log stands 10 inches tall and measures 7 x 5 1/2 inches across. Please email for shipping charges. 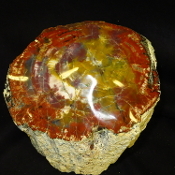 This AZ Petrified Wood polished log stands 13 inches tall and measures 7 x 7 inches across. Please email for shipping charges. This AZ Petrified Wood polished log stands 14 inches tall and measures 11 1/2 x 8 1/4 inches across. Please email for shipping charges. This AZ Petrified Wood polished log stands 18 inches tall and measures 13 x 14 7/8 inches across. Please email for shipping charges. This AZ Petrified Wood polished log stands 9 3/8 inches and measures 7 1/2 x 7 inches across. It has been hand polished. Please email for shipping charges. This Stunning AZ Petrified Wood polished log stands 11 inches and measures 12 1/4 x 10 3/4 inches across. It has been hand polished. Please email for shipping charges. This AZ Petrified Wood polished log stands 11 inches and measures 10 1/2 x 11 1/2 inches across. It has been hand polished. Please email for shipping charges. This AZ Petrified Wood polished log stands 10 inches and measures 12 1/2 x 10 1/2 inches across. It has been hand polished. Please email for shipping charges. This AZ Petrified Wood polished log stands 11 inches and measures 15 x 14 inches across. It has been hand polished. Please email for shipping charges. This AZ Petrified Wood polished log stands 8 inches and measures 11 x 9 1/4 inches across. It has been hand polished. Please email for shipping charges. This AZ Petrified Wood polished log stands 8 1/2 inches and measures 13 x 14 1/4 inches across. It has been hand polished. Please email for shipping charges. 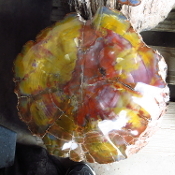 This small AZ rainbow Petrified Wood log is hand polished on top and down one side. It is 8 inches across and stands 13 inches tall. Please email address for shipping charges. 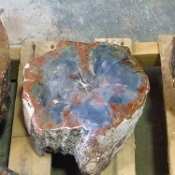 This hand polished AZ Woodworthia log measures 15 x 12 x 27 inches. Woodworthia is recognized by its unusual "bumpy" or "dimpled" bark, it is one of the more rare species of AZ Petrified Wood. Please email for shipping charges. 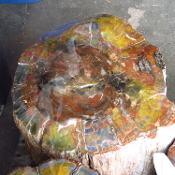 This hand polished AZ Petrified Wood log measures 23 x 17 x 8 inches. Please email for shipping charges. This AZ Navajo Petrified Wood polished log stands 19 inches tall and measures 13 5/8 x 8 1/4 inches across. It has been hand polished. Please email for shipping charges. 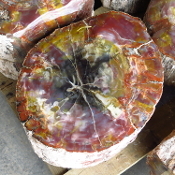 This AZ Petrified Wood polished log stands 39 inches and measures 15 x 16 1/2 inches across. It has been hand polished. Please email for shipping charges. This AZ Petrified Wood polished log stands 7 inches and measures 21 1/2 x 17 inches across. It has been hand polished. Please email for shipping charges. This AZ Petrified Wood polished log stands 16 inches and measures 13 3/4 x 14 1/2 inches across. It has been hand polished. Please email for shipping charges. This AZ Petrified Wood polished log stands 27 inches and measures 9 1/2 x 7 inches across. It has been hand polished. Please email for shipping charges. 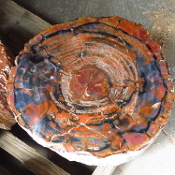 This AZ Petrified Wood polished log stands 10 1/2 inches and measures 19 x 28 inches across. It has been hand polished. Please email for shipping charges. This AZ Petrified Wood polished log stands 9 inches and measures 15 3/4 x 10 inches across. It has been hand polished. Please email for shipping charges. This AZ Petrified Wood polished log stands 59 inches and measures 13 x 12 inches across. It has been hand polished. Please email for shipping charges. 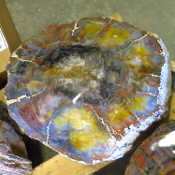 This AZ Petrified Wood polished log stands 13 inches and measures 15 x 11 1/2 inches across. It has been hand polished. Please email for shipping charges. This AZ Petrified Wood polished log stands 13 inches tall and measures 10 3/4 x 13 1/4 inches. Please email for shipping charges. This AZ Petrified Wood polished log stands 8 3/4 inches tall and measures 10 1/8 x 7 1/8 inches across. It weighs over 43 Lbs. Please email for shipping charges. This AZ Petrified Wood polished log stands 23 inches tall and measures 12 1/2 x 20 inches across. Please email for shipping charges. This AZ Petrified Wood polished log stands 19 1/2 inches tall and measures 8 1/2 x 7 5/8 inches across. Please email for shipping charges. This AZ Petrified Wood polished log stands 18 inches tall and measures 8 x 6 5/8 inches across. Please email for shipping charges. 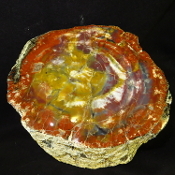 This polished log of AZ Petrified Wood stands 10 1/2 inches tall and measures 9 1/2 x 8 inches across. Please email for shipping charges. This polished log stands 7 inches in the back and tapers to the floor. It measures 18 x 12 1/2 inches across the face. Please email for shipping charges. This polished log stands 14 inches tall on the back. The face measures 15 1/2 x 22 inches. Please email for shipping charges. 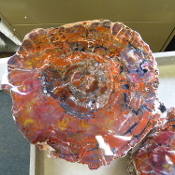 This polished log is 4 1/2 inches thick. It measures 16 1/2 x 15 inches across the face. Stand not included. Please email for shipping charges. 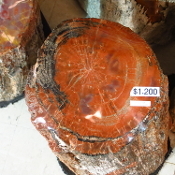 This Polished Log stands 16 inches tall and measures 9 x 11 1/2 inches across. Please email for shipping charges. This AZ Petrified Wood polished log stands 13 inches tall and measures 10 x 11 3/8 inches across. Please email for shipping charges. This AZ Petrified Wood polished log stands 17 1/2 inches tall and measures 7 3/4 x 8 1/4 inches. Please email for shipping charges. This AZ Petrified Wood polished log stands 18 inches tall and measures 9 x 13 inches across. Please email for shipping charges. This AZ Petrified Wood polished log stands 13 1/2 inches tall and measures 7 3/8 x 8 1/2 inches across. Please email for shipping charges. This AZ Petrified Wood polished log stands 14 inches tall and measures 9 1/2 x 10 inches across. Please email for shipping charges. 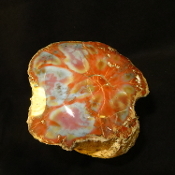 This AZ Petrified Wood polished log is 4 1/2 inches tall and measures 12 1/2 x 12 1/4 across. Please email for shipping charges. 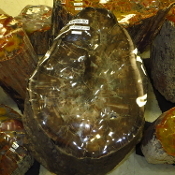 This stunning AZ Petrified Wood polished log stands 13 inches tall and measures 11 x 10 inches across. Please email for shipping charges. This AZ Petrified Wood polished log stands 10 1/2 inches tall and measures 10 3/4 x 12 inches across. Please email for shipping charges. This AZ Petrified Wood polished log stands 10 inches tall and measures 13 x 9 1/2 inches across. Please email for shipping charges. This AZ Petrified Wood polished log stands 16 inches tall and measures 10 1/2 x 12 1/2 inches across the face. Please email for shipping charges. This AZ Petrified Wood polished log stands 12 inches tall and measures 11 3/4 x 9 inches across. Please email for shipping charges. This AZ Petrified Wood polished log stands 23 inches tall. The face measures 16 x 13 1/2 inches. Please email for shipping charges. This AZ Petrified Wood polished log stands 10 inches tall. The face measures 11 x 11 inches. Please email for shipping charges. This AZ Petrified Wood polished log stands 12 inches tall. The face measures 11 1/4 x 10 inches across. Please email for shipping charges. This AZ Petrified Wood polished log stands 9 1/2 inches tall. The face measures 14 x 9 1/2 inches across. Please email for shipping charges. This AZ Petrified Wood polished log stands 8 1/2 inches tall. The face measures 15 1/4 x 12 1/4 inches. Please email for shipping charges. This AZ Petrified Wood polished log stands 8 inches tall. The face measures 10 x 12 1/2 inches across. Please email for shipping charges. This AZ Petrified Wood polished log stands 15 inches tall. The face measures 10 1/2 x 9 inches across. Please email for shipping charges. This AZ Petrified Wood polished log stands 7 inches tall. The face measures 10 3/4 x 8 1/4 inches. Please email for shipping charges. This AZ Petrified Wood polished log stands 11 1/2 inches tall. The face measures 8 3/4 x 7 inches across. Please email for shipping charges. This AZ Petrified Wood polished log stands 12 inches tall. The face measures 16 x 15 inches. It weighs 191 Lbs. Please email for shipping charges. This AZ Petrified Wood polished log stands 6 inches tall. The face measures 9 3/4 x 8 inches. Please email for shipping charges. This AZ Petrified Wood polished log stands 11 1/2 inches tall. The face measures 12 1/2 x 10 inches. It weighs 88 Lbs. Please email for shipping charges. This AZ Petrified Wood polished log stands 6 3/4 inches tall. The face measures 13 x 12 inches. Please email for shipping charges. 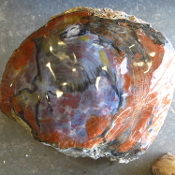 This hand polished AZ Petrified Wood log measures 16 x 21 x 25 inches. It weighs 561 Lbs. Please email for shipping charges. 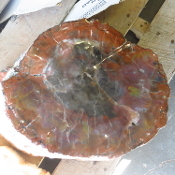 This AZ Petrified Wood log has been cut and polished. It measures 23 x 20 inches across the face. It stands 30 inches tall. Please email for shipping costs. 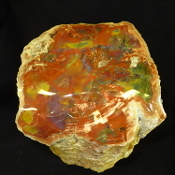 This very large and stunning AZ Rainbow Petrified Wood hand-polished log measures 24 x 29 x 32 inches. Please email for shipping charges. 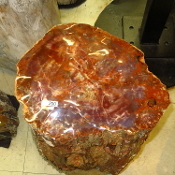 This AZ Petrified Wood polished log stands 18 inches and measures 13 1/2 x 19 inches across. It has been hand polished. Please email for shipping charges. 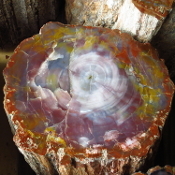 This Stunning AZ Petrified Wood polished log stands 19 inches tall. The face measures 8 3/4 x 6 1/2 inches. Please email for shipping charges. This AZ Petrified Wood polished log stands 16 inches tall. The face measures 16 x 10 inches. Please email for shipping charges. This AZ Petrified Wood polished log stands 9 1/2 inches tall. The face measures 9 x 10 inches. Please email for shipping charges. This AZ Petrified Wood polished log stands 18 inches tall. The face measures 11 x 17 1/4 inches. Please email for shipping charges. This AZ Petrified wood polished log stands 16 inches tall. The face measures 12 x 12 inches. Please email for shipping charges. This AZ Petrified Wood polished log stands 14 1/2 inches tall. The face measures 12 x 10 inches. It weighs 120 Lbs. Please email for shipping charges. This AZ Petrified Wood polished log stands 16 inches tall. The face measures 14 x 12 1/2 inches. Please email for shipping charges. This AZ Petrified Wood polished log stands 12 1/2 inches tall. The face measures 13 x 18 1/4 inches. Please email for shipping charges. This AZ Petrified Wood polished log stands 20 inches tall. The face measures 12 x 12 inches. Please email for shipping charges. This AZ Petrified Wood polished log stands 6 1/2 inches tall. The face measures 13 x 15 inches. Please email for shipping charges. This AZ Petrified Wood polished log stands 7 inches tall. It measures 22 x 17 1/2 inches across. Please email for shipping charges. This AZ Petrified Wood polished log stands 13 1/2 inches tall. It measures 12 x 14 inches across. Please email for shipping charges. This AZ Petrified Wood polished log stands 8 inches tall. It measures 7 3/4 x 12 inches across. Please email for shipping charges. This AZ Petrified Wood polished log stands 9 inches tall. It measures 10 x 11 inches across. Please email for shipping charges. This AZ Petrified Wood polished log stands 10 1/2 inches tall. It measures 11 1/2 x 12 inches across. Please email for shipping charges. This AZ Petrified Wood polished log stands 7 inches tall. 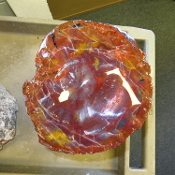 It measures 11 3/4 x 9 1/2 inches across. Please email for shipping charges. This AZ Petrified Wood polished log stands 18 inches tall. It measures 12 3/4 x 14 1/2 inches across. Please email for shipping charges. This AZ Petrified Wood polished log stands 9 inches tall. It measures 11 1/2 x 15 inches across the face. Please email for shipping charges. This AZ Petrified Wood polished log stands 18 inches tall. It measures 11 1/4 x 8 1/2 inches across the face. Please email for shipping charges. This AZ Petrified Wood polished log stands 11 inches tall. It measures 14 3/4 x 10 1/2 inches across the face. Please email for shipping charges. This AZ Petrified Wood polished log stands 14 inches tall. It measures 9 1/2 x 18 inches across the face. Please email for shipping charges. This AZ Petrified Wood polished log stands 8 1/2 inches tall. It measures 15 x 11 inches across the face. Please email for shipping charges. This AZ Petrified Wood polished log stands 11 inches tall. It measures 15 x 13 1/2 inches across the face. Please email for shipping charges. This AZ Petrified Wood polished log stands 14 inches tall. It measures 13 3/4 x 16 1/2 inches across the face. Please email for shipping charges. This AZ Petrified Wood polished log stands 6 inches tall. It measures 13 3/4 x 16 1/2 inches across the face. Please email for shipping charges. This AZ Petrified Wood polished log stands 4 inches tall. The face measures 11 x 12 inches across. Please email for shipping charges. This AZ Petrified Wood polished log stands 5 1/2 inches tall. The face measures 9 3/4 x 8 inches across. Please email for shipping charges. This AZ Petrified Wood polished log stands 7 1/2 inches tall. The face measures 12 x 12 inches across. Please email for shipping charges. This AZ Petrified Wood polished log stands 9 inches tall. The face measures 14 1/2 x 12 inches across. Please email for shipping charges. This AZ Petrified Wood polished log stands 21 inches tall. The face measures 11 x 14 inches across. Please email for shipping charges.